Are you ready for the second class in our 10Years 10 Classes celebration. I am! 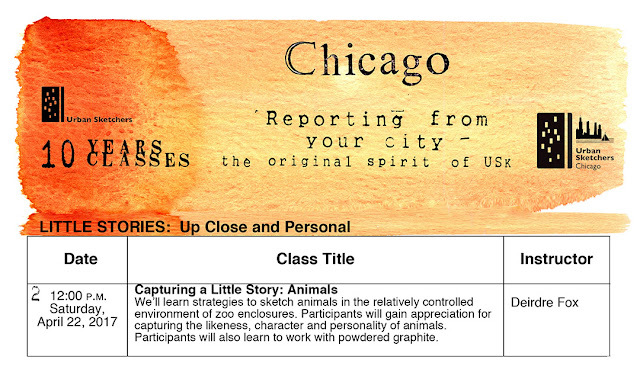 What exciting and fun times in Chicago for Urban Sketchers! We have the ongoing hashtag and tag project. Be sure to tag your Chicago sketches! #USkChicago #USkChicago2017 #Urbansketchers @USkChicago @USkSymposium. Step 1: Sketch your favorite Chicago scene, from observation on location. Step 2: Scan/photograph your sketch and post it to Facebook, Instagram and Twitter. Step 3: In your captions, tell us where the sketch is from, make sure to tag @uskchicago (in Instagram), @usksymposium (in Instagram), @usk_chicago (in Twitter), and include the hashtags: "#uskchicago2017" and "#uskchicago"
NEED MORE INFORMATION AND STEP BY STEP INSTRUCTION? Twitter is a short form blog where users make posts called "tweets". Tweets are 140 characters or less. 1) Download Twitter App on your smartphone. Or, sign up for an account on your computer. "Heading out to sketch with @USk_Chicago today"
"A sketch from today's @USk_Chicago sketch meet"
"Found this @USk_Chicago blog post helpful"
A re-tweet shares another user's tweet with your followers. For example USk Chicago (@USk_Chicago) could re-tweet one of your sketches. Hash tags make your post searchable. When a hash tag is placed in front of a word, that word is sent to a database that can be viewed by anyone searching for that word. For example, #urbansketchers. Other urban sketchers around the world use this hash tag when they tweet. When you search #urbansketchers you will find thousands of other tweets related to urban sketching. When tagging (@) another user in your post, the user you tagged will be notified that you tagged them. So, when you tweet your sketches, help USk Chicago know that you are tweeting your sketched by including "@USk_Chicago" in your Tweet. Instagram is another type of short form blog dedicated to posting and viewing photographs and short video clips. Unlike Facebook where you can make folders to organize images, an Instagram account holds all of your photos in one location.